A jury has concluded that a prisoner repeatedly started fires in her cells in what she claimed was a protest at ‘abuse of her human rights’. A two-day trial at Leeds Crown Court heard how Melanie Shaw, who was unfit to stand trial, started three fires in her cells at HMP Foston Hall in Derbyshire and HMP New Hall in Flockton, near Wakefield. At the conclusion of what is called a finding of fact trial  at Leeds Crown Court , a jury of seven women and five men spent less than an hour reaching the verdict that she committed three counts of arson being reckless as to whether property was damaged or destroyed. Shaw had served just one month of a prison sentence at HMP Foston Hall for harassment and breach of a restraining order when she started the first fire. The mother of one person harassed by Shaw gave her account in a 2016 video interview which can be seen here. 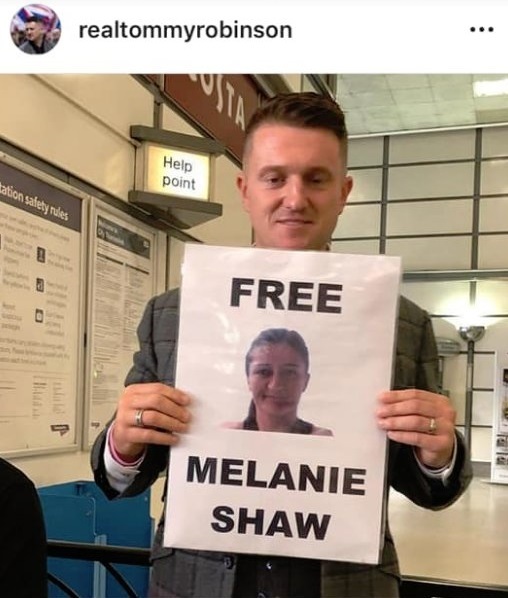 As I blogged just recently, Shaw is a cause célèbre among conspiracy theorists, and also now within the fringe-right: last month, Tommy Robinson and Kevin Carroll were seen waving “Free Melanie Shaw” placards outside the Old Bailey, while UKIP leader Gerard Batten used Twitter to promote a an article about her published by the website Politicalite, a self-described “independent populist news outlet read by thousands of readers per month” controlled by a man named Jordan James. A VULNERABLE whistleblower of the horrific abuse of children which occurred at a county council-run home in Nottinghamshire in the late 1980s has been locked up, without a fair trial and has today been declared ‘Unwell’ to appear in court, Politicalite can reveal. Melanie Shaw, who is a survivor of abuse at a children’s home in Nottingham remains in a high-security prison with no substantive evidence against her in a suspected “Cover-Up” by the Establishment. …She says she is not being given her Valium. If so, this is of grave concern, as it will at best cause discomfort, and at worst cause seizures which could be fatal. In fact, however, and as I noted previously, allegations relating to Beechwood Community House in Nottingham were first investigated by police as Operation Daybreak in 2010, which was followed by a wider investigation in 2015 called Operation Xeres and then Operation Equinox. Local media report that hundreds of statements have been taken (including one from the actress Samantha Morton), and the subject is currently being considered by the Independent Inquiry into Child Sexual Abuse (despite Batten’s false claim in his Tweet that the inquiry “Seems to have gone quiet”). Further, Shaw is apparently still able to communicate with the outside world via her supporters. None of this would be the case if there were a “cover-up” going on. As expected, the Examiner Live article – which also refers to support Shaw received from Robinson – has not been universally appreciated. Its author, court reporter Stephanie Finnegin (2), is currently being accused on Twitter of producing “fake news”, and she has fielded aggressive questioning from an account called @cupcake25831762 – Hoaxstead has screenshots. The account was created last month and has Tweeted just 61 times: it is obviously the creation of a troll farm (the same avatar appears on at least one other troll account), demonstrating that someone is deliberately trying to stir things up. There are, of course, circumstances in which the justice system has to wrestle with defendants who are too ill to participate in a normal trial, but too dangerous to be ignored. When that is necessary the law has no choice but to adopt an uneasy compromise between the defendant’s rights and the public need for protection. There is no reasonable doubt that Shaw is mentally ill, and a risk to public safety. 2. UPDATE: Hoaxstead reminds us that Finnegan was the journalist who challenged reporting restrictions about Robinson’s imprisonment for contempt of court at Leeds Crown Court in May. Her reporting on the subject angered Robinson’s supporters, who in particular complained that she had referred to the street in which Robinson lives – a detail that LeedsLive has explained is included as standard practice in court reporting (“This information is given in open court for the media to publish, and is designed to ensure identification of the correct defendant in a case”). In an odd twist, however, it was afterwards discovered that Robinson had given the court an old address rather than his present home anyway. Some of Robinson’s supporters reportedly resorted to making threats against Finnegan, some of a sexual nature.